Milka LEO - crispy waffles and chocolate cream filling are covered with delicate Milka Alpine Milk Chocolate. Sugar, wheat flour, cocoa butter, hardened vegetable oils, cocoa mass, skimmed milk powder, sweet whey powder, butter oil, vegetable oils, emulsifier: soy lecithin, salt, coffee extract, flavors. CONTAINS MILK, WHEAT GLUTEN, SOY. MAY CONTAIN TRACES OF NUTS AND EGG. 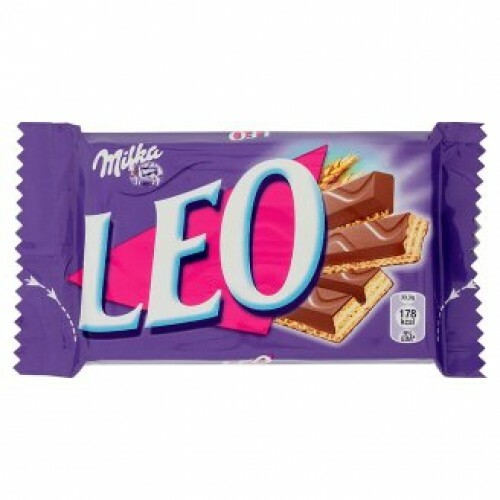 Milka Go bar Leo! Go Leo! Big Size format with bite! The light snack between meals made ​​of li..